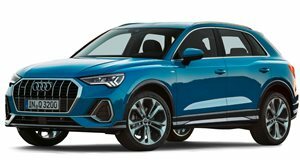 The all-new 2019 Audi Q3 made its world debut last summer, but we didn’t know how much the compact crossover will cost when it eventually goes on sale in the US – until now. Audi has announced the new second-generation Q3 will make its North American debut at the 2019 New York Auto Show this week while also confirming US specifications and pricing. The base 2019 Audi Q3 Premium starts at $34,700 - that's nearly $2,000 more than its predecessor, which started at $32,900. Three trim levels will be available in the US: Premium, Premium Plus, and Prestige. An optional S line exterior pack is also available for an extra $1,300, which adds sportier front and rear bumpers, new side sills, different badges, and 19-inch alloy wheels. The Premium Plus model starts at $37,800, while the range-topping S Line Prestige trim will set you back $42,900. Prices exclude the $995 destination and handling charge. Regardless of the trim level, all Audi Q3 models in the US only have one powertrain option: a 2.0-liter TFSI turbocharged four-cylinder gasoline engine that produces 228 hp and 258 lb-ft of torque, which is 28 more horsepower and 51 lb-ft of additional torque over the previous model. The turbo-four enables the Q3 to sprint from 0-62 mph in seven seconds. All-wheel drive and an eight-speed automatic transmission are both standard. The new Q3 also features a redesigned front five-link suspension that’s said to offer a comfortable yet agile ride for long distances. Audi drive select with five different drive modes (comfort, auto, dynamic, offroad, and individual) is also standard. Standard features for the second-generation Audi Q3 also include LED headlights and taillights, LED headlights and taillights, 18-inch alloy wheels, aluminum exterior trim, roof rails, a 10.25-inch gauge cluster display, an 8.8-inch touchscreen infotainment system, Apple CarPlay, Android Auto, a heated power driver's seat, two rows of USB ports, a panoramic sunroof and dual-zone automatic climate control. Automatic emergency braking is also standard, with other safety systems available as options including lane departure warning, adaptive cruise control, and park steering assist.